“The Beginner's Guide to Revelation” from Christian Faith Publishing author Ray Sullins explores the Book of Revelation. In “The Beginner's Guide to Revelation,” Ray Sullins examines the final book of the Bible to help readers find answers about the end-times. “The Beginner's Guide to Revelation”: a comprehensive breakdown of the Bible’s most controversial and thought-provoking book. 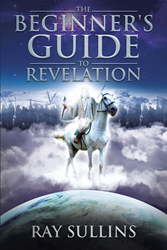 “The Beginner's Guide to Revelation” is the creation of published author, Ray Sullins. Ray is a husband, father, grandfather, son, brother, and veteran of the United States Marine Corps who served his country in Vietnam. Called to the gospel ministry in mid-life, he earned a bachelor of science degree in Bible and Leadership Principles from the College of Biblical Studies in Houston, Texas. He also earned his master of arts degree in biblical studies from Dallas Theological Seminary. Ray has served his Lord in the ministry as the pastor of two Houston area churches. He currently serves on the pastoral staff of a church in Baytown, Texas. He has served the Lord in a variety of vocations, most recently as an investigator for the Harris County Probate Courts. Although he is now retired, he believes the Lord has opened up another door of service as a Christian author. Published by Christian Faith Publishing, Ray Sullins’s new book is a comprehensive guide to the Book of Revelation. As world events careen toward what appears to be a terrifying precipice, a growing number of people see mounting signs that the long prophesied end-times are upon the world. More and more people are turning to the final book of the Bible for answers. “The Beginner's Guide to Revelation” aids both new believers and long-time students of God’s Word in their quest to find answers in the Book of Revelation. Ray Sullins guides readers through the maze of imagery and helps to discern the figurative from the literal. He, of course, always points readers to the central character of Revelation, the Lord Jesus Christ. View a synopsis of “The Beginner's Guide to Revelation” on YouTube. Consumers can purchase “The Beginner's Guide to Revelation” at traditional brick & mortar bookstores, or online at Amazon.com, Apple iTunes store, or Barnes and Noble. For additional information or inquiries about “The Beginner's Guide to Revelation”, contact the Christian Faith Publishing media department at 866-554-0919.